This new year begins with an important update for Reading Transitioners. Alex and Rachel will soon be moving from Reading and therefore, leaving their active role in this community. We decided to thank them quoting Chris Rhodes words. Repair Café will return this month, and Refill Reading is involving more and more cafes. “I think we all received this news with a mixture of celebration for this new phase of your life, but sadness too, because we are really going to miss both you and Rachel, of whom we have grown very fond! You both arrived at a critical time (at the end of 2012) for TTR, and the group would almost certainly have folded without your fresh energy and input; you have also been the linchpin in sustaining it since then. You have brought to fruition many new ideas, particularly the Repair Cafe which has become the flagship project, and your more recent involvement in the Refill Reading campaign, to mention but two”. We all wish you and Rachel a very Happy and successful New Year and new phase of life! The first Repair Café in 2018 will take place in the Main Hall above the RISC cafe. There will be limited parking available accessible from East Street. Reading Bike Kitchen will be joining us to fix your bike! There will be tea, coffee and cake, and everything is free. Donations are always welcome to help keep Repair Cafe going. 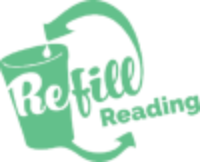 The number of cafes which joined the Refill Reading Campaign is now gone up to 18 and the first batch of cups is almost sold out! Join “Urban Room”, “Great Place Project” and “Art and Culture” to discuss the future of Reading and to learn more about it.